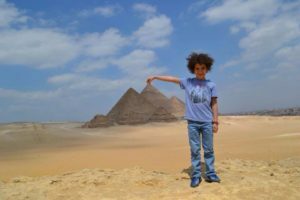 In this great tour you will explore the cemetery of the first capital of Egypt which contains the great pyramids, the sphinx and the step pyramid complex at Saqarra. The Giza plateau in the vast desert, the land of the dead. Guarded by the Great Sphinx, the plateau is dominated by the massive pyramids of Khufu, Khafre and Menkaure. To the south of the Great Sphinx, lie the cemetery and Town of the pyramids Builders. The pyramids are indeed remarkable feats of engineering. But the question is “why the pyramids were constructed?”. The pyramids were constructed in the 4th dynasty, but Giza remained important through the New Kingdom and the 3rd intermediate period. There are so many theories about the techniques of the pyramids construction. Notes: tickets of entry inside the pyramids aren’t included. Saqarra lies in the west bank of the Nile. It is very vast burial ground, was serving as the cemetery of Memphis, the first capital of Egypt. 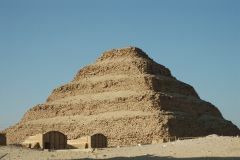 It includes the famous step pyramid of Djoser and some other mastabas. 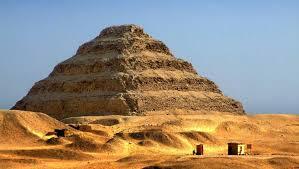 The step pyramid complex is the oldest stone structures in the history. Some pyramids were built at Saqarra by the kings of the 5th and 6th dynasties, such as Userkaf, Unas, Pepi I and Pepi II. Some private tombs of the Old Kingdom were built there. The best known tombs are those of Ti, Kagemni, Ptah hotep and Meruruka.